At times, technology PR can feel like a shape-shifting beast — large, fast-moving, and even a little intimidating. In an earlier post, we discussed what makes tech such a different animal. 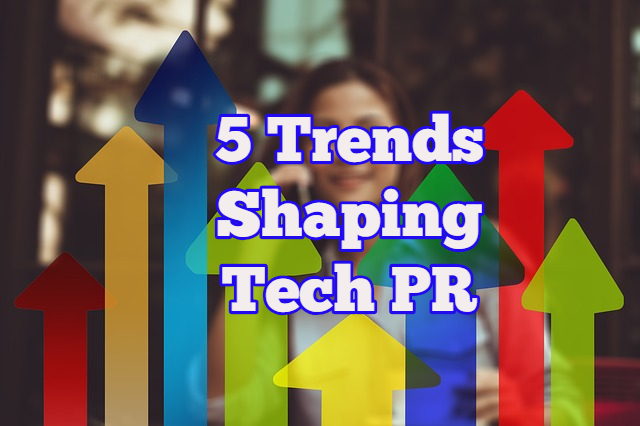 Now we explore some 2018 trends and issues that continue to affect the tech PR sector. Of course, by the time this is posted, a new trend will have arrived to nudge the paradigm. The GDPR privacy rule officially blazed into our lives in May. Some thought it wouldn’t affect U.S. marketers so much, but in today’s digital environment, everyone is impacted. And it won’t be the last data protection or privacy regulation we’ll see. In July, the state of California passed its own data privacy regulations called CCPA, and other states are sure to follow. Like many companies, PR firms need to ensure that our content marketing and other campaigns are compliant with the new regs. On the bright side, GDPR has presented opportunities for data privacy and security thought leaders to build visibility and reputation through insights and expert commentary. Data privacy issues will only grow in importance in how we work as well as how we promote clients. Once upon a time, Facebook, Google, and Apple were viewed as shining examples of U.S. innovation and heroes of a more socially and commercially connected future. They’re still hugely successful, but things have changed. The 2016 election and the Cambridge Analytica data privacy scandal accelerated what has been a gradual erosion of Big Tech’s reputation. Many have come to believe that the tech giants have too much influence and that their growth threatens user privacy and possibly our well-being as a culture. For tech PR agencies who represent early-stage companies and other technology companies, the dominance of the giants extends into the mediascape, monopolizing the attention of key journalists. Yet as much as the Big Tech players can block out the sun, savvy PR people can also take advantage of their visibility by newsjacking or responding to the latest moves of an Amazon or Apple. Every major trend in tech PR revolves around the collection and application of data, from cyber-security to account-based marketing (ABM). Internally, data can inform our PR strategy and make our branded content better and more engaging. data-driven storytelling drives some of our best tech PR campaigns by winning points with journalists, boosting end-user or customer engagement, and attracting the most relevant audience. Quality data has made better PR monitoring and measurement possible. And, of course, the data we create through our own branded research for clients creates news. We all know AI and machine learning technologies are infiltrating many aspects of or lives. For those who work in tech PR, AI has not yet radically changed the way we do business, though it has affected who we do business with — clients in everything from analytics to supply-chain software now use AI to enhance their products and services. As AI tools revolutionize the way we consume and monitor news, PR pros may be able to get faster and more accurate reads on a social conversation surrounding a brand — and perhaps be able to neutralize a crisis before it erupts. It may also help us measure the impact of what we do — from a media placement to the full brand reputation of a client. Plus, AI tools are playing a role on the other side of the media relations coin: journalists are beginning to use AI solutions to read pitches, generate story ideas, and gauge what their audiences want to read. Even if you’re not part of the ICO craze, blockchain will surely affect you if it hasn’t already. The tech PR world has no choice but to get with the “distributed ledger” program. Though the applied technology is still in its early days, its future is huge. Beyond payment processing and banking, blockchain has implications for fraud verification, digital ad transparency, influencer marketing and data privacy — in short, many of the concerns tech agencies and their clients currently face. There’s even talk of future blockchain applications in the practice of PR, which may be alarming since one of the main premises of the technology is the removal of the middle-man – PR firms. Not to worry, PR people. Wasn’t the internet supposed to do the same thing?